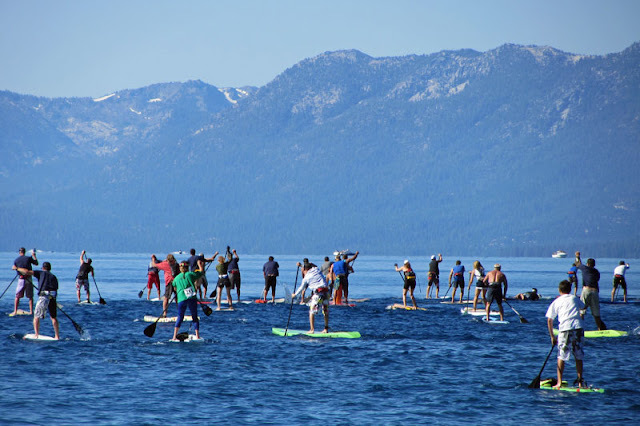 This Saturday, July 14, is a paddleboard and Stand-Up-Paddle (SUP) race in Tahoe City. Race day registration is accepted for this 6 mile event at Commons Beach. The race begins in Tahoe City and finishes in Waterman’s Landing at Carnelian Bay. If you can’t participate, come to Commons Beach and see what these races are all about. I spectated at the Race for Humanity SUP race last weekend and thoroughly enjoyed myself. The Race for Humanity was a rather low-key event with about 60 entrants. The top times for the 10K event were under 1hour and 10 minutes. Paddleboard racers should start arriving at Waterman’s Landing around 10:00am. Get there to cheer them in.